Royal Dog, a South Korean artist produced this piece. It was created entirely with spray paint. SYNTEK is behind 'L.A. woman' - a piece that has remained untouched since 2013. WRDSMTH is now a commissioned artist, hired to create his inspiring typewriter pieces in office spaces and the like. Freeart Ramone is around 75-years-old. He fills up Christmas baubles with paint, tapes them shut and then smashes them on the floor to create his art. MegZany is best known for creating messages that support women empowerment. 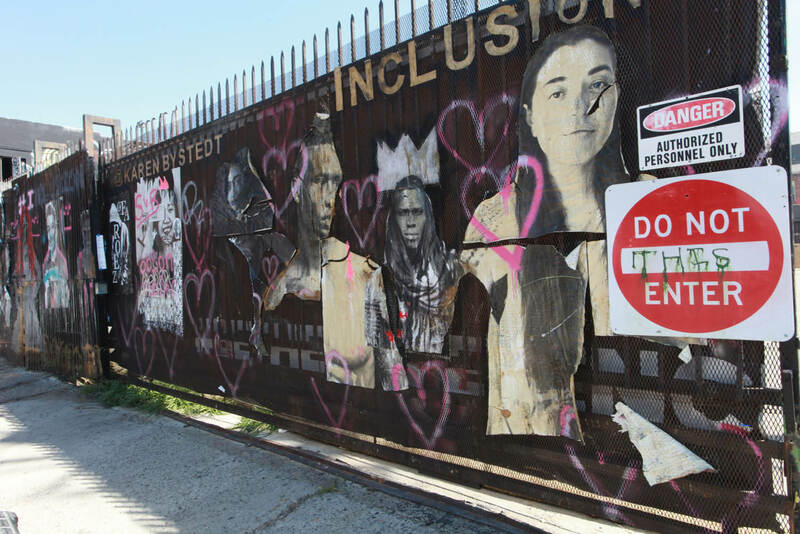 A gate in the Los Angeles arts district that has been turned into street art. A sprawling city of nearly four million inhabitants, Los Angeles means many things to many people. For me, it has traditionally been a place to come to indulge my love for all things Disney, Universal Studios and the Hollywood Walk of Fame, rather than to check out the art galleries. But on this occasion, I was ready to try something new. While the Hollywood film industry put L.A. on the cultural map during its golden age mid-last century, the Californian city’s art scene has long flown under the international radar: overshadowed in reputation by New York and its blockbuster galleries, or European capitals and their long and storied art histories. Influential British artist David Hockney might have moved to L.A. over 50 years ago – famously painting the swimming pools of modernist houses – but it’s only in recent years that the rest of the world has started catching on, helped by excellent museums like the Los Angeles County Museum of Art (LACMA), the Getty Center, and Hauser & Wirth Los Angeles, which – covering 116,000 square feet – became the largest gallery in the USA when it opened two years ago. Street art too has a long history in L.A.’s urban culture, and it was time for me to get to explore it and delve into a side of the city I hadn’t before. I make my way to the burgeoning Arts District – where Hauser & Wirth is located in a former flour mill – and arrive at a meeting place that looks like the car park of an industrial area, with a glimpse or two of a garage mural. I’m a little confused. How could this be the cultural epicentre of Los Angeles? An old-school street artist, I peg Kevin at around mid-40, though he looks a little like Peter Pan, kept youthful no doubt due to the mischievous nature of his job; painting – sometimes illegally – in the street. There’s a kind of thrill to it, you can see it when Kevin talks. It’s mostly an operation conducted at night so as not to be caught by the police – and in that, the thrill is delivered. Kevin’s ‘day job’ is a mix of both creating commissioned (read: legal) street art and guiding the Downtown Graffiti and Mural walking tour I’ve joined today. He’s like the friend of the street art community, the anchor that binds them all together – and he’s proud of the efforts of the artists, new and established. As we walk around the streets, Kevin explains that only a few artists can actually afford to live in the Arts District now, most having to move to cheaper neighbourhoods, as real estate is bought up in their beloved streets. It’s no shock that the street art wage won’t buy you your dream home; unless of course, you’re Banksy. 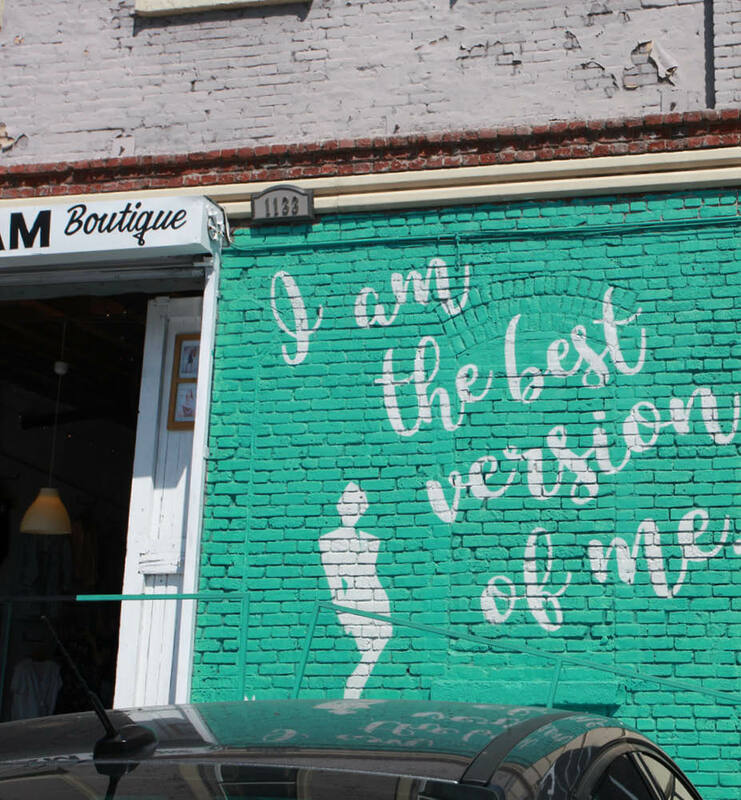 I notice a few names written on the walls as we walk, and I take the opportunity to ask Kevin the difference between simple name scribbles, and the incredibly detailed floor-to-ceiling murals we were passing on the street. He explained that tags are artists testing certain spots. If their tag is still there the next day, they come back and do a bigger tag, if that’s still there after a week, they might come back and create a bigger mural. The street artists often collaborate on murals, working together like recording artists would to produce content. It also comes in handy when someone needs to stay on the lookout for police, Kevin says. Police aside, the people these artists are hiding from – and testing for – are part of a free service in Los Angeles dedicated to covering graffiti and discouraging artists, they’re also the ‘villains’ of this tale – they are, Graffiti Abatement. Kevin speaks of Graffiti Abatement with obvious disdain, especially when he sees art by one of the older street artists that’s been painted a hideous shade of brown. Artists see these streets as their blank canvas, and walking alongside them, you can’t help but feel a sense of kinship; they’re not hurting anyone, they’re staying inside the ‘walls’ of the Arts District, so what’s the problem? Why cover them with this awful brown paint? It feels sad when you see it. But like with every good story, you come to realise that without the villain, there can be no heroes. Blake taps away with tiny nails for hours, nailing silver tin to power poles around the streets. Often hundreds of nails are used for each piece. It must take him hours, but there’s a reason, your eye is drawn to them; it’s something to do with the contrast between the shiny silver and the roughness of the wooden pole. Kevin describes Blake as a “75-year-old guy with a white beard”, and you get the sense that he’s respected in the community. I spot a giant typewriter, and it fills the garage door from top to bottom. Within the page, words read, ‘aspire to inspire others and the universe will take note’. I instantly get the warm and fuzzies. Kevin explains that a formerly illegal artist, WRDSMTH, is responsible. 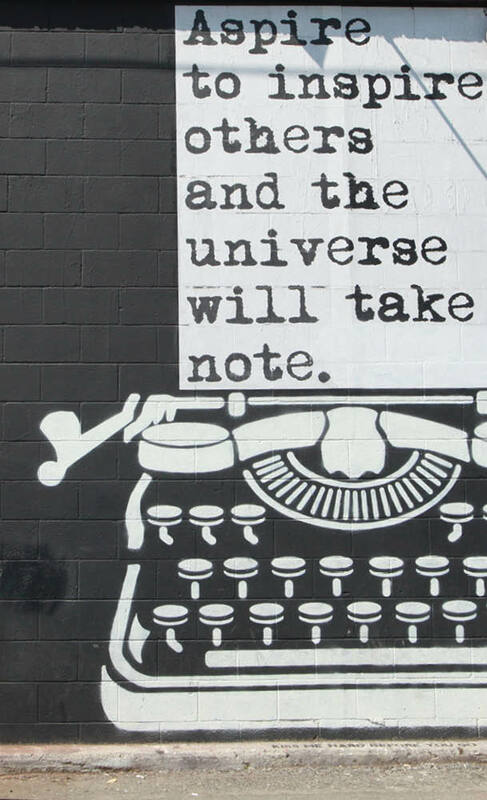 He started by creating small typewriters with powerful messages all over town, and became so popular that people now ask him to come and paint a wall, or their office space. There’s a sense that WRDSMTH ‘made it’ – and that he’s one of the lucky ones. Kevin points out a piece by MegZany and describes her distinct style: powerful stencils with words to match. She’s all about messages of female empowerment. He also explains that the artist’s work gets painted over all the time. I feel sad, but somehow, not surprised. Kevin explains that there aren’t all that many female street artists; 20 years ago there were none at all. He reveals that there’s still a degree of misogyny, with many people thinking women shouldn’t be spray painting in an alley at 3am – they should be at home with the kids. Something tells me MegZany would have something to say about that view. Like Blake Shane, Freeart Ramone is one of the older guys, around 75 years old is where Kevin pegs him. We’re all standing around looking down on the ground – a new vantage point for this tour – as we take in his particular brand of street art. “He does it for fun,” Kevin explains. “He carries glass Christmas ornaments filled with paint, tapes them up and smashes them on the ground around town.” They’re kind of beautiful. Kevin explains that this particular artist, Nicky Nailed It, posts his ‘kids’ all around town. The kids are actually pictures of little smiling cherubs, and though his art is considered illegal, he “doesn’t mind if people pull them off, because then they have his art in their home”. 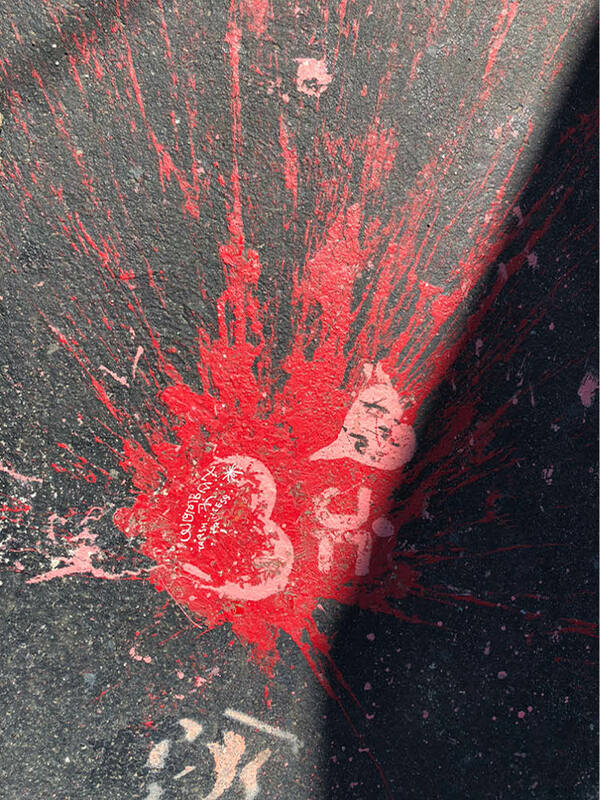 I realise that, beyond its visual impact, sometimes the art is more about the message, and how it makes people feel. A mysterious artist, Kevin explains that Syntek doesn’t like to be photographed, and wears a little mask when he paints so people can’t photograph him. He was the artist behind the phenomenal L.A. Woman, which was painted in 2013. 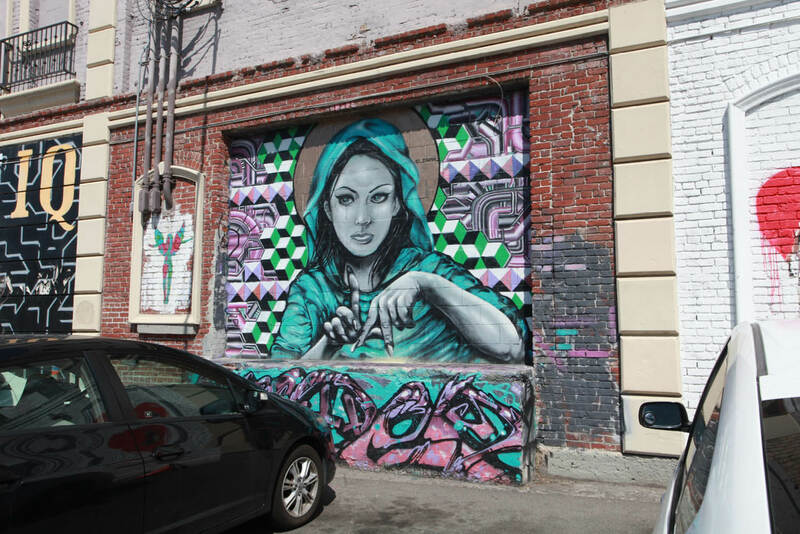 The striking woman, clad in a turquoise hooded cape and holding her hands in a way that spells ‘L.A’, is well known within the Arts District. Flint explains that few murals are left for longer than a year or two, so the fact that L.A. Woman has been left untouched for five years only plays into the skill and symbolism of the work – and its lasting impression on the community. People across L.A. and beyond might be familiar with DABSMYLA’s brightly coloured brand of murals, installations and paintings. The Aussie husband and wife team work on commissions the world over, but have been based in Los Angeles for nine years. I have the pleasure of spending an afternoon with them, and gaining an insight into their whimsical style of pop art. While in their studio, I learn of their association with graffiti historian Roger Gastman, who is known as the connector between street artists and the art world. He’s also the curator of Beyond the Streets; a ground-breaking exhibition that celebrates graffiti and street art – including the works of DABSMYLA – across 3700 square metres of industrial indoor and outdoor space in Downtown L.A.’s Chinatown. Also featuring everyone from Banksy to L.A. artist Shepard Fairey (he of Obama Hope poster fame), the multimedia exhibition showcases paintings, installations, sculptures and photography, and is a consolidation of the spirit and energy I’ve witnessed during my walking tour. It’s also one that is in keeping with street art’s rebellious nature, as Roger explains. “[Beyond the Streets is] a follow up to a show we did several years ago called Art in the Streets … we had over 220,000 people through that, the most they [the Los Angeles Museum of Contemporary Art (MoCA)] had ever had”, Roger says. However, this time around, we learned that MoCA wouldn’t be hosting the event, and that Roger is taking Beyond the Streets into his own hands. “For five or six years we’ve wanted to continue the show and for a lot of reasons we haven’t… so we said, you know what? Let’s not worry about the museums, let’s not worry about the board telling us we can’t do things. Let’s go do something on our own terms for our own reasons. And tell the true stories about where the culture is currently,” he says. It’s one thing to hear about the beating heart of Los Angeles’ Arts District, but having spent a day exploring it firsthand – I’m proud. I’m proud to know more about the people who are making their (beautiful) mark as unconventional artists. My hope is for that brand of boundless creativity to continue, to offer locals and travellers alike an incredible alternative to the traditional Los Angeles tourist traps. Beyond the Streets runs from 6 May to 6 July 2018. 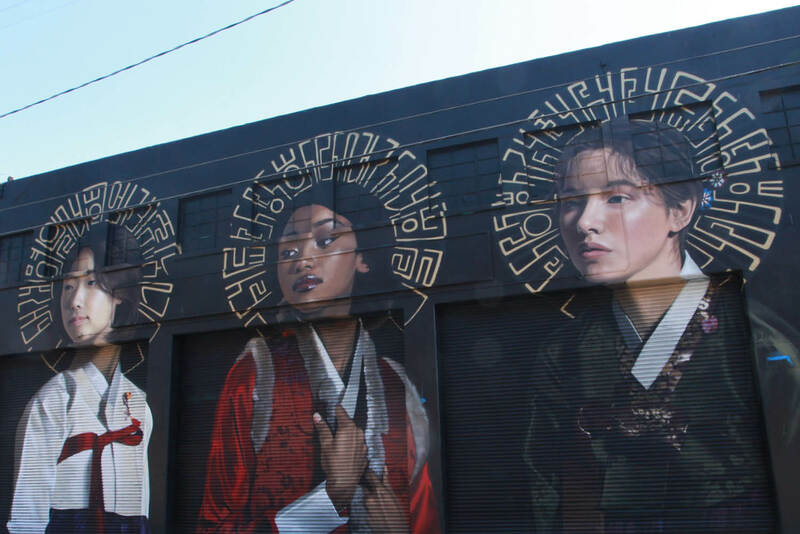 These tours take you through the artist communities of Los Angeles, showcasing secret galleries and mural-filled streets of the Arts District. Where: The Downtown Graffiti and Mural tour starts in front of Dejavita art boutique in the Arts District. 533 Colyton St, Los Angeles, 90013. When: the tours run on Thursdays, Saturdays and Sundays.